There's a risk in critiquing any new technology as unnecessary because technology creates its own necessity. We all managed to live without smartphones ten years ago, now most young Americans couldn't do it. I don't think Nissan's "smart rearview mirror" — basically an LCD monitor instead of mirrored glass — is technology most of us need. I spent a few days driving around in a new Nissan Rogue equipped with a prototype version of the mirror and found it to be not much better than a typical mirror. Why? A standard mirror works quite well and this particular technology suffers from almost identical problems. But before I explain all the ways it fell short, let's get into the concept and the promise of this "smart" mirror. 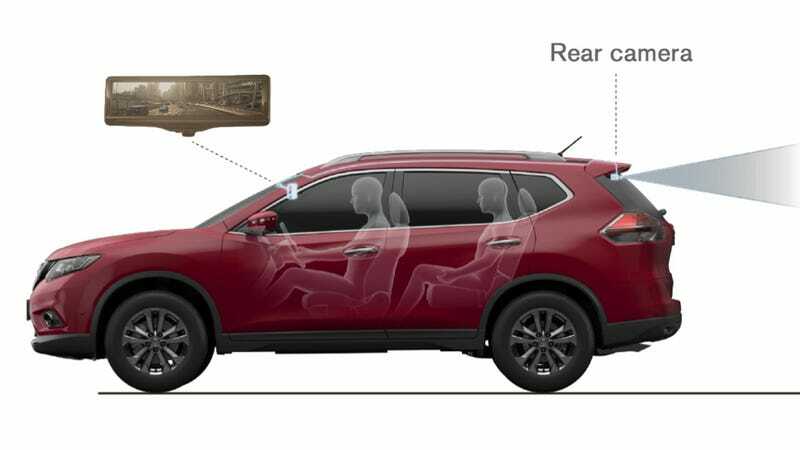 Quite simply, they've added another camera to the Rogue's suite of sensors, above the rear glass, that offers an adjustable view of the world behind you. Instead of a typical mirror there's an LCD screen in roughly the same shape though thicker. [T]he Smart Rearview Mirror can provide a clear image in a variety of environmental conditions including rain, snow, dawn and dusk. The high-quality camera and image processing system implemented in the LCD monitor consistently results in a clear image with minimal glare, even during sunrise or sunset conditions or when the vehicle is being followed by a vehicle with strong headlights. Some of this is true. There's no worrying about headrests or heads blocking the view behind you. Super bright headlights or a setting sun don't challenge your eyes the same way they would with a regular mirror. However, like a canoe with a built-in toaster oven, it's one of those concepts that lives up to its promise better in theory than in practice. On a sunny day or with bright headlights you still suffer from a similar problem you would with a regular mirror because the surface also reflects light, so the LCD mirror is just about as useless as a regular one. You can see this in the photo. Thankfully, this option also has a switch that allows you to go between a regular mirror and a screen (this might also contribute to the glare), so you have both options as you need them. In normal weather under normal conditions it works fine. I'm not sure it's much better than just using a mirror, and the mirror has a higher fidelity, but it's not bothersome… although the mirror did fall of from too much adjustment (once again, it's a prototype). The other challenge here is that Nissan already has the best camera system in the market with their 360-degree view. While you shouldn't need a million cameras to park your car, it sure is damn helpful. Contrasting this helpful technology with the Smart Rearview Camera probably makes it harder to appreciate. None of this means you won't have a reason to get this on your car. First and foremost, reducing the rear window allows for more aerodynamic designs. Anyone who has driven a mid-engined car (or a Nissan 370Z for that matter) knows rear windows are mostly for show and rarely useful.